While every Finale user has a unique workflow, people within a specific area of the music industry often share similarities in their notation creation. As we continue to refine Finale, we follow both these similarities as well as idiosyncrasies in indiviual workflow. Members of the Finale team are in regular communication with all kinds of Finale users, from the film studios of LA to the stages of Broadway (and beyond) to stay abreast of how all kinds of musicians are using notation – and to see how we can help their workflow with future development. 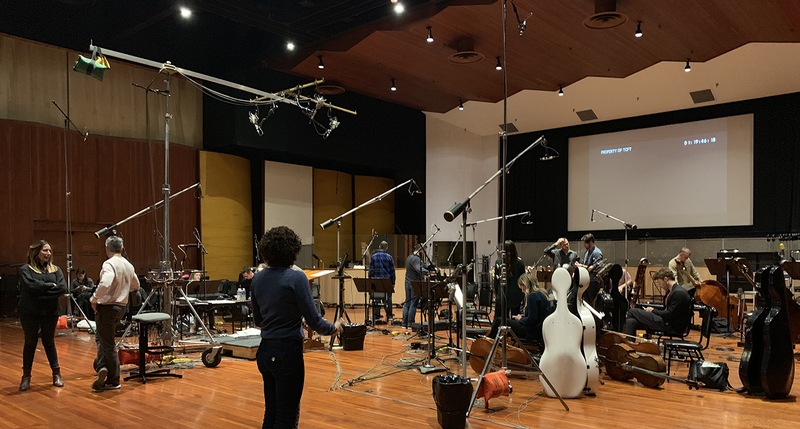 While attending the winter NAMM show in Anaheim, California every January gives us a regular occasion to meet with many people face-to-face, this year we also had an additional opportunity; to attend a scoring session for Fox’s award-winning musical drama series Empire at the Eastwood Scoring Stage. As I thoroughly enjoyed our visit to the Warner Brothers lot, I thought I’d post the experience for others who might share my enthusiasm. We were lucky to have a perfect night for our visit. The moon was out and the WB water tower was magically illuminated. We were especially appreciative of the California weather as our co-workers back in Colorado were riding out a snowstorm. Just like in the movies we had to stop at the guard gate and get past security. We are pictured at the top of the post with our hosts, from left to right, Tim Davies (lead orchestrator and conductor), Fred Flowerday (MakeMusic’s Sr. VP of business development), myself, Jeremy Levy (orchestrator), and Greg Jamrok, from JoAnn Kane Music Service, who are in charge of music preparation for the show. 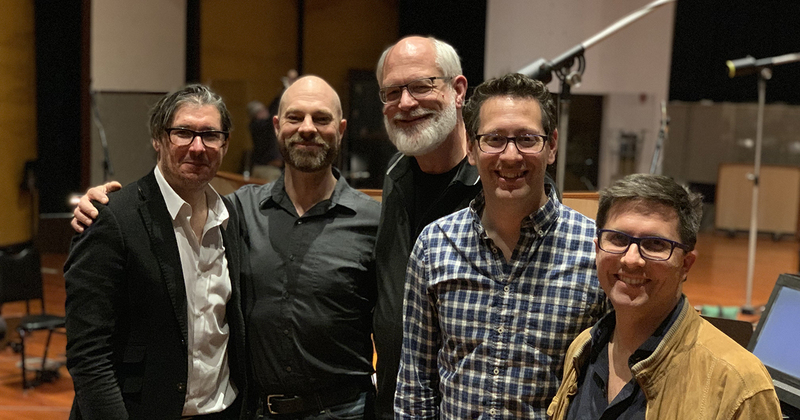 Before the session began, Fred and I chatted with Tim, Jeremy, and Greg about everything from dinner (the session began at 7:30 pm) to Finale 26, which was used to score all the music for the date. We also made a solemn vow to not photograph either the notation or the video, to make certain we didn’t unintentionally provide a spoiler for our fellow Empire fans. As the session began, Fred and I sound sofa seats behind the Tim (who was conducting), with our backs to the glass of the control room. We watched as a small orchestra, with a handful of winds, warmed up in a beautiful room that could easily accommodate a much larger ensemble. The sound was truly lovely. Visiting with people while they’re working in a recording studio can often be a bit awkward, with an atmosphere that suggests you are simply in the way. Not so here, where everyone was clearly very comfortable, welcoming, and at the top of their game. If you haven’t attended a similar session, you might have been surprised at how many of the cues were very short; just a few seconds long. Each might be played multiple times, but only to make the most top-level adjustments, like asking the second violins to play a specific section a little warmer or to try dividing divisi parts in a different way. While Greg was on hand to make any last minute Finale changes, I didn’t see anything more significant than a penciled-in revoicing. This evening at least, nothing required any kind of rewrite. A tremendous amount of attention went into each cue, including those that will nearly be nearly inaudible, under dialog, when heard on a mediocre television with the family dishwasher running in the background. I found myself fantasizing about upgrading to a home theater type of sound system where this level of meticulous craft could be better appreciated. 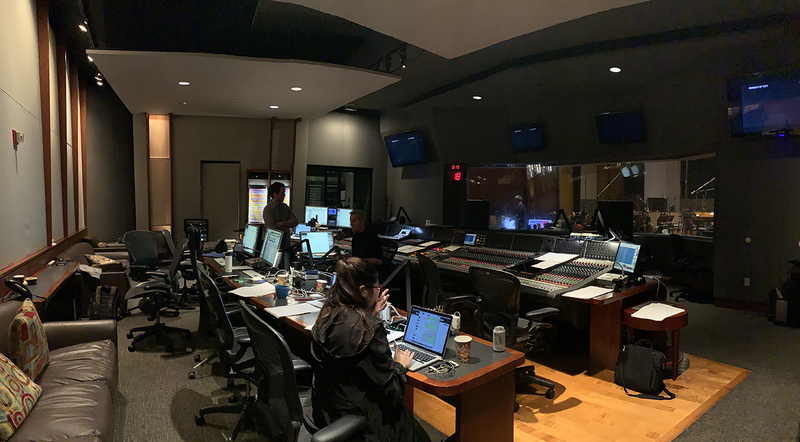 For the second half of the session, we joined Jeremy and Greg in the control room. The difference between what we heard here from what we heard outside was significant. While my expectation was that we’d hear a very dry, unprocessed sound (which would typically make it easier to hear any potential errors), what we did hear was a very nice “rough” mix, with added ambiance and all. That said, little things like the rare foot shuffle were really magnified by the micing. This, I imagine, was in part enhanced due to the small size of the group. Again, the quality of each performance, the quality of the intonation, was impeccable. Everyone in the room seemed to always be 100% in sync. Then, before we knew it, the session was over. I think we were in and out of there in something like two hours. Thanks again to Tim, Jeremy, and Greg for inviting us. While admittedly we could have shared the evening’s Finale-based discussions with them via email, it was really fascinating – and delightful – to see it all in person, and Finale in action. 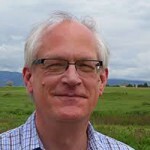 Mark Adler is MakeMusic’s director of production/senior editor, a professional trumpet player, teacher, and a freelance music editor and engraver. Mark is particularly passionate about features that provide musicians with additional visual options for their scores AND save time in the process.